Many kids now at one time or another suffer indigestion because there's a disturbance in the digestive function of the stomach or its failure to digest food. I myself sometimes experience indigestion. 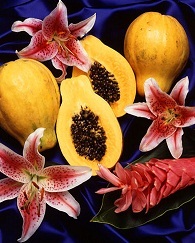 To aid digestion in the body we should follow some suggestive measures like withhold food intake for four hours, drink one glass of hot water every hour during the 4-hour fasting, eat a slice of ripe papaya 30 minutes after a heavy meal and eat light meals without fatty foods after the four-hour fasting. Eat as a fruit dessert, especially with heavy meals. It helps in the digestion of protein. Boil 1 cup in 5 glasses of water for 10 minutes. Add 1/2 teaspoon salt. Apply the leaves directly on the stomach while still warm Use abdominal binder. Renew every 2 hours. Good for children and babies.